For many engineers the most exciting part of developing a product is being able to say, “it’s done!” But this really isn’t the end of the cycle, getting the product to the market is the developer’s next step. Projects that involve engineers in the marketing process reap added benefits. Technical teams exploring your product, without exception, are more open with their information when speaking with you engineers. By taking advantage of this “brotherhood of engineers” bond, designers can glean insights into future needs and requirements to gain an early leg up on their next generation products. Marketeers spend hours upon hours developing branding campaigns, datasheets, technical articles, ads, brochures, PowerPoint presentations, application notes, flashy web pages, and more to assist the sales force in winning a potential buyer’s trust and eventually their business. The quality of these tools is critical to the success of the front line salesperson. When these tools are inadequate, creativity steps in and all too often “winging it” results in some degree of lost credibility. We have all experienced the over exuberance of a salesperson trying to embellish their product beyond the point of believability. Creating dynamite sales tools requires forethought and planning. It begins with a thorough understanding of the product’s value propositions. Whether the product concept is originated within the marketing department or the engineering department, it is the engineers who have to embed the values into the new product. Marketeers then need to extract those values from engineering in the form of features and benefits that can be translated easily into ‘sales-speak’. 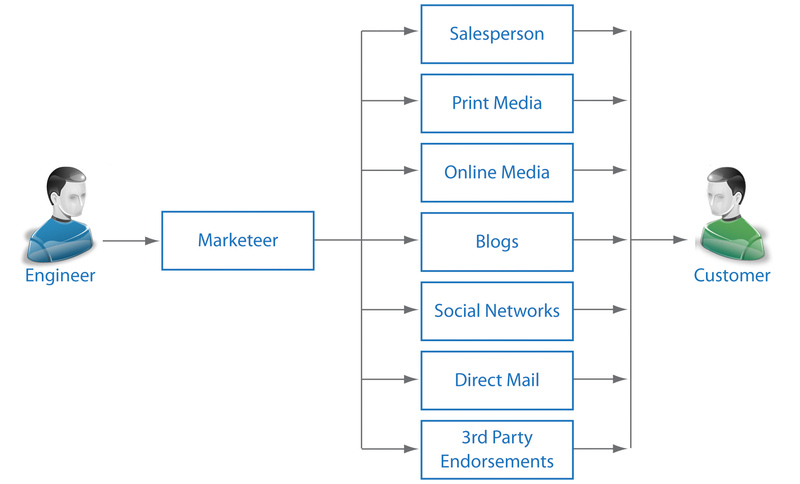 The information flow has gone from engineer to marketer to sales person to potential buyer. There are dozens of different channels through which information is delivered to a potential buyer. It requires discipline to keep the message consistent across all of them. Think back to your first grade class, when on a rainy day, the teacher gathered everyone in a circle and whispered something into the ear of the child to the right and then asked them to do the same to the child to their right. By the time the information came full circle to the teacher, it barely resembled the original message. Today, there are dozens of different channels through which information is delivered to a potential buyer. The critical technical information, that which can make or break a sale, originates in Engineering (See Figure). It is obvious how confusing the message can become when the buyer is barraged with dozens of interpretations. Some channels truncate the message to fit their format (how much can be communicated in 140 characters?) while others will rewrite and add interpretations and comparative analysis. In the end, the buyer does not know who to believe. There are several ways to assure your company is delivering strong and consistent messaging. For some companies this means retaining a dedicated person in the marcom department with strong technical writing and organizational skills. Another solution is to work with a PR (public relations) firm that focuses on the electronic industry, and their team focuses on the timeliness of the communications flow and manages the various channels for consistency within the channel as well. When all the basics have been covered, it is then time to deploy the secret weapon; the engineer. Placing engineers face to face with potential buyers is becoming a more common occurrence. The buyer’s appetite for the product has been stimulated by marketing’s branding and product positioning. Properly executed, the positioning has resulted in several third party endorsements that the buyer cannot refute. Publish “How To” articles, authored by the engineer-expert. Many times these are ghost written on the basis of inputs supplied by the engineer. A creative marketing effort will find many ways to promote and repurpose this content, whether in multiple regional markets or in different formats such as application notes, presentations, and Q&As. Host webinars that allow many potential buyers to simultaneously participate in a technical lecture or series of lectures provided by the engineer-expert. There is significant effort required for planning, promoting, and executing to ensure a qualified audience is in attendance. Publish “opinion” or ‘white” papers that address a general industry concern and offer pragmatic approaches to solutions demonstrate a level of expertise by the engineer. While we often stereotype engineers as the ‘Dilberts’ or ‘Wallys’ of the world, they are in fact one of a company’s best assets in closing a sale. They deal in a world of facts and figures, and equations and laws of nature that do not change. They abhor vagueness and embrace truth. To the buyer, their word is golden. In the buyer’s mind, ‘they are one of us’. It is difficult to avoid the adversarial nature of a sale. We’ve been taught that there is a winner and a loser in the transaction. Involving the engineer in the process can greatly lessen the tension and extract clearly the real value of the product to the buyer, yielding a win-win scenario. Lutz on Are you, or would you consider, using a 4-bit microcontroller? Jeet on Do you ever think about endianess? lol on Are you, or would you consider, using a 4-bit microcontroller? BP on To MMU or not to MMU? © Copyright 2010-2012 Embedded Insights Inc. All rights reserved.